There was an excellent article circulating a few weeks ago about how write in deep point of view. 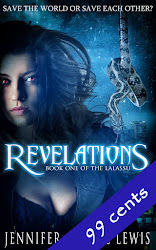 It's become a popular choice for novels over the last ten years and certainly provides a more intensive and immersive experience for a reader. But is it necessarily the right choice all the time? Most stories use a combination of the different approaches, although one will tend to predominate. A scene which focuses on a single character might include an offhand reference to another. For example, the scene might be in Celina's perspective, but she observes someone whose "lips clenched in determination" during an interaction. Technically, Celina can't know why the other person's lips have clenched. She can only guess or interpret, not know. This is where deep point of view comes in. In deep point of view, we only experience the story through one character (or at least, one character at a time). This can be a very intimate experience, letting the reader effectively live in the character's head, but it does have some limitations. The author cannot bring attention to something the character is unaware of (Eg, "he'd forgotten that he was supposed to pick up milk" or knowing that a trick or deception is occurring.) This can make it more difficult to maintain tension. If the reader doesn't know that a character is walking into a trap, there is no build up of anticipation before the trap shuts. Deep point of view can also cause trouble during scenes with intense action. A character in the midst of a fight or riot or other chaos cannot be aware of all that is happening around him or her. It can also get quite confusing and frustrating for a reader to figure out what is happening. A little chaotic perspective can be good in setting mood or emotional reactions, but too much becomes a jumbled page-skipping muddle. A final challenge for deep point of view is clumsy narration. Sometimes there are plot points which require additional information which the point of view character could not plausibly know. Often writers solve this by adding scenes from a different point of view character, which can slow the pacing of a story. Another issue is describing other characters, such as the example above where Celina cannot know that her companion is clenching their lips in determination. Substituting "Celina guessed the woman was determined from the clenching of her lips" can also slow pacing and feel artificial. There are solutions to all these challenges and when deep point of view is done correctly, it is a very intense experience. Even if a writer chooses not to use deep point of view consistently, I would recommend it for scenes of strong emotional impact. It will enhance the emotional depth and draw the reader in. The key to a great story is not to always do A, B and C, but to know and understand what writing tools will create the effect an author is looking for. Not bad for a week where I lost two days to errands. The words are really flowing nicely right now. I got a question asking whether or not I include my non-fiction word total in my weekly word count. And the answer is that the word count only includes work on my novels or short stories. Blog posts, articles and other writing don't count. I do a lot of non-fiction work. I have the two posts here every week, plus I do a daily blog in my "real" life about what's going on to keep my family and friends updated. I do at least two articles a month for Apartment 613 and I'm trying to get back in the habit of posting regular book reviews on Goodreads. My non-fiction work is probably close to 4000 words a week, but that doesn't get the next book any closer to being written. It's tempting to "cheat" and count it if I've had a bad week and no progress on the book. But I started posting my weekly word counts to keep me honest and motivated. I don't like having to say that I haven't made progress and so it gets me in front of the keyboard when it would be otherwise too easy to put it off. Thanks for keeping me going, blog readers. Recently, the RWA issued an apology for survey done in 2005 which asked RWA members to vote on whether romance should be redefined as being between one man and one woman. This was rightly dismissed as being too restrictive and excluding ménage and polyamory romance as well as LGBTQ romance. The RWA said the survey should never have been done. "In issuing the survey, RWA failed its members, its genre and its mission.... We apologize for letting our members down and for failing to treat all our members with the respect they deserve." That, to me, went to the heart of the issue. Withdrawing RWA support from those subgenres would have been an attempt to silence them. Because each voice enriches us and ennobles us and each voice lost diminishes us. I support the right of everyone to tell both their own stories and any other story which resonates with their soul. In the wake of the apology, there have been a number of posts and tweets condemning those who tell stories which "don't belong to them" and blaming them for preventing authors from those groups and cultures from telling their own stories. I can understand the frustration underlying those posts, but, respectfully, they miss the point. We are not alien and separate from one another. We have far more in common than we have differences. Thus, claiming that those outside a particular group can have no insight or interest to offer is just plain wrong. They are not authorities, but can offer different perspectives. Writers of colour and writers from other groups, such as LGBTQ, have traditionally been discriminated against when it comes to publishing. That's a fact and I don't dispute it. But the problem lies in publication and promotion, not in the number of stories out there. Calls to silence other writers will not solve the inherent problem. I will support efforts to encourage more diversity in submissions and in publications. I will support efforts to bring attention to diverse writers. But I won't support silence. I was speaking about this post with a friend of mine, who rightly asked: would I support telling stories that I consider morally repugnant? Last year, there was a debate over a contest submission which featured a Jewish woman falling in love with a Nazi commander and converting to Christianity. Obviously it was a story which resonated with someone and they spent considerable effort telling it. Here's how I split that particular hair: I support the right of the author to tell that story. I would have a problem promoting it as I feel that real love requires a sense of equality which can never be between a jailer and someone slated for genocide. I was also offended by the idea of the heroine abandoning her faith in order to achieve love. But the solution to my offence is not to demand the author's silence. It's to use it as an example to share why such ideas are a problem. The solution to offensive speech is not censorship, it's more speech. Taking a moment for my untalented yet enthusiastic dance of victory. I ended up going back and doing a new chapter eight, then bumping the original chapters eight, nine and ten all up one (and I'll admit I rewrote a significant portion of each of them). I am now working on the new chapter eleven (formerly known as chapter ten), so I'm back on track and in a much stronger plot position. It feels good to have things working and flowing. I'm really liking how my heroine is developing. She's a lot angrier than any heroine I've dealt with before, but she's got some good reasons to distrust and be enfuriated by the world at large (and the hero, who will eventually have to learn not to stick his foot in his mouth). 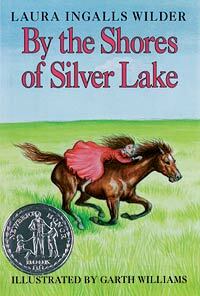 I first picked up my first Little House book in grade school through a Scholastic Order. In the ultimate judging a book by its cover, I chose it because it had a horse on the cover and I was going through a horse stage. In By the Shores of Silver Lake, I found the story of a pioneer family on the move, shifting from their grasshopper and scarlet fever plagued home in Plum Creek to the unsettled prairies of De Smet, South Dakota. As a military brat who was constantly on the move myself, it spoke very strongly to me. I could identify with Laura's constant struggle to find a balance between her internal drives and the demands of society. I immediately demanded the complete series. I was intrigued by the early books, such as Little House in the Big Woods﻿, with its catalogues of food preparation and self-sufficient household management, and On the Banks of Plum Creek, where Laura faces the town bullies and her first experience of social shame. 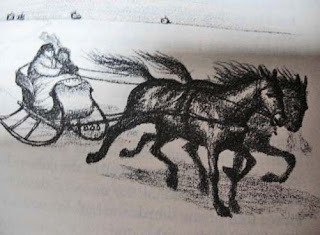 But to me, the part of Laura's story which truly ensnared me were the stories from her years in De Smet and the slow courtship between herself and Almanzo Wilder. Starting with his week twenty-four mile round trip sleigh rides to bring her home in Little Town on the Prairie, Almanzo always struck me as the epitome of a romantic gentleman. He never puts any pressure on Laura or implies that she "owes" him for his efforts. At great risk and personal inconvenience, he makes a grand gesture simply because he wants to do something to make her happier. Laura isn't certain how to react. On the one hand, she desperately wants to go home on weekends and Almanzo is her best chance to do so. On the other, she doesn't want to mislead him into believing that they are courting. It's a difficult balancing act, especially considering that Laura is only fifteen and has spent most of her life interacting only with her family. As an adult who adores a good love story, I'm disappointed that there never seems to be any moment where Laura shifts from seeing Almanzo as a friend to seeing him as a romantic partner. But as a child and adolescent, they seemed to be one of the great couples of literature, and their love was as inevitable as the rising sun. They get married and set up housekeeping on a claim of their own, in a small house which Almanzo built with his own hands. It's a perfect happily ever after. Except it wasn't. 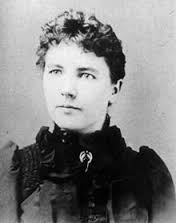 I recall the moment when I first realized that Laura Ingalls Wilder wasn't merely the author of these stories. 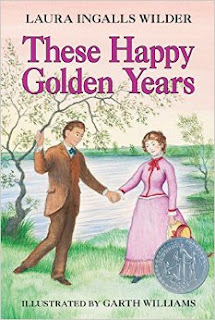 It was the first time I read These Happy Golden Years and abruptly realized that the author's name was the same as the married name of the main character. I was shocked and then began to wonder what happened after the wedding. I read The First Four Years and was horribly disappointed to discover things did not go smoothly for Laura and Almanzo. Their house catches on fire, they're always in debt and Almanzo gets sick with diphtheria and is permanently injured, needing a cane to walk for the rest of his life. I cried when I realized that Laura had to leave the beautiful little house that she was so pleased with and board yet another westward wagon. There are really two heroines to examine: the fictional Laura Ingalls and the real life Laura Ingalls Wilder. The fictional Laura is the first one I got to know. She doesn't quite fit in with the expectations she must live up to. She's a tomboy, she's curious, she's fiercely protective and loyal to her family, and she's proud of being self-sufficient and beholden to no one. As she grows up, she takes on the role of family provider, earning money to support the family and serving as a guide to her blind sister, Mary. She's a strong young woman who refuses to back down and allow others to push her or her family around. There's a lot of that strength in the real life Laura as well. She worked hard to keep her family going through famine, fire and disease. She started her life over and over and over and, while I'm sure she must have gotten discouraged, she didn't give up. Toward the end of her life, she decided to fictionalize her early life story. Initially she wrote an autobiographical novel, Pioneer Girl, but then split it into the novels of the Little House series. The books helped to keep her family going as she and Almanzo grew too frail to maintain the daily chores of the farm. She's not a revolutionary or a progressive thinker. She simply refuses to bend on her own internal principles. She never quite seems to question that perhaps the expectations of her society are wrong or unfair. Instead, she quietly finds her own compromises and happiness. Laura offers an interesting middle ground of rebellion. She doesn't shrivel up and conform but she doesn't insist on anyone else following her example either or attempt to overthrow the authorities she disagrees with. That's the element of Laura which I admire. She found her path and committed to it, working hard to get where she wanted to go. At the start of this week, I did not think I was going to be able to make my count. I was having a lot of trouble with the story's flow. I knew where I needed to go, but couldn't quite figure out how to encourage my characters to get from where they were to where they needed to be for the next step. I'd barely done 1500 words by Thursday and I wasn't very happy with what I had. I realized I needed to take a step back and figure out where I started to go wrong. I've found that when I have writers' block or a plot crash, it's because I've forgotten to include a thread I'd been planning on using or I've inadvertently blocked off an avenue. Usually going back a chapter or two and reviewing what I've done is enough to get me back on track. This time, two chapters wasn't enough. I went right back to the first chapter and began making chapter by chapter notes on all the subplots I'd set up. This way, I could have my complete plot tapestry in front of me and figure out where I got off track and, more importantly, how to get myself back on the path. After going through the first ten chapters, I had my answer. I'd gotten very caught up in a subplot which is important to the overall series arc and I'd accidentally dropped the romance arc between my hero and heroine. Once I realized that, the words and ideas started to flow smoothly once again. I've heard many different opinions on writers' block over the years. Some authors advocate taking time away from writing until the muse is ready to speak again. Some tell us to just keep writing through the garbage until we've dug through to the veins of gold waiting underneath. Personally, I think it's important to try and get to the source of the blockage. When the words stop flowing, it's a sign that something is wrong. Figuring out where I've made the mistake has always been the key to breaking through blockage for me. Last weekend, a friend of mine asked "How can you love action movies so much? You write books about people embracing. You should be with me on wanting something without explosions." At the time, I made a joke about it just being the result of my multiple personalities, but later, as I thought more about it, I decided there were actually a lot of similarities. I like both because both appeal to similar instincts in how I feel a story should run. Genre Driven: Both action movies and romances must follow a certain pattern of events or else they aren't satisfying to the audience. Many use that fact to criticize both as fluff entertainment, but don't seem to appreciate that writing a compelling story is an exercise in skill, particularly when that story must meet certain audience expectations. Thus there are a lot of very skilled writers in both romance and doing action screenplays. What was I saying? Oh yeah. The heroes (and heroines) of both romance and action are larger than life. They are able to cope with situations which would leave most of us sadly dead or broken in real life and do it with relative ease. Need to rescue someone from an international slave ring, break through bullet proof glass and drive a car backwards through the streets of Peru? All in a days' work for these ladies and gentlemen. 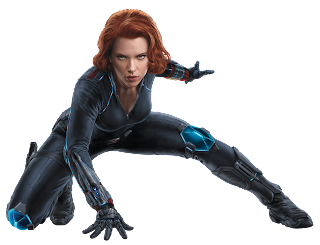 Character Growth through Romance: There is a reason why the hero rescuing an ex-spouse is such a universal action trope (the other one being when they are forced to work/protect someone they don't initially get along with). Through the development of the romantic subplot, the hero gets to show character growth. 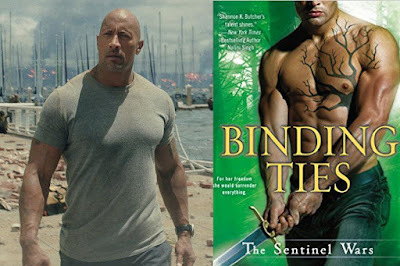 Granted, a romance novel will explore the relationship as it develops while an action film will imply more than explore, but the seeds are still there. Happily Ever After: It's not an action movie if the hero doesn't succeed. Those are called tragedies, or possibly, the Watchmen. And it's not a romance if the couple doesn't end up together as well as having succeeded in their personal goals. Critics see this as a flaw, but I see it as a strength. The audience of both genres literally knows how it will all end. This means that a writer must be very skilled to still create tension and drama to keep us interested, which has led to some very clever and nuanced plots. I'm not claiming every action movie or every romance is a gem. But there are a lot of quality stories in both genres, which is why they've remained so popular. Those who dismiss both as frivolous are missing the strengths of the genres. They both offer hope. Hope that the world can be a better place and that what we dream isn't as impossible as we fear. Another good week of progress. Chapter 10 done, about a third of the way through the projected story for Inquisition. I also put together a short story for a blog post looking for fractured fairy tales and did an article for 613 on ORWA and how I joined. 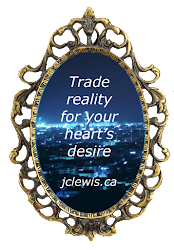 I'm working on a article on the upcoming Romancing the Capital event in May. I didn't count them toward my weekly total, but that's another 3000 words. I'm feeling fairly good about myself. And we had an awesome time at this month's ORWA meeting. Lots of good editing tips from Laura Byrne Paquet and a great visit at the pub afterwards. On the promotion side, I'm trying to find a nice tote bag that I can put my book cover on. Something I can carry around the various events I'm going to. I'm going to spend a lot of time in line at Comiccon, so I might as well be a walking billboard for my book.